The Best Lures for Redfish imitate what they eat, are durable enough to withstand the abuse dished out by these fish, and are effective in shallow water. Redfish are the most popular gamefish along the Gulf Coast. They fight like heck, are delicious to eat, and can be found in water so shallow their backs stick out of the water! This makes for some challenging fishing, and lures for redfish have to be up to the task. Read on to learn how Buggs Fishing Lures have you covered on all these fronts. You'll also hear first hand accounts from one of the best skinny water fishing guides around, Captain Scott Null. And at the end you'll find a tournament winning tip and sweet deal on Buggs! There are times when redfish aren't that picky, when finding them and getting the lure in front of them is the lion's share of the work. But then there are times when they're keyed in on a certain bait or just plain sluggish. That's when you have to be able to imitate what they're eating: large or small, bait fish, shrimp, or crab. Or you might have to entice them to eat, period! Buggs Fishing Lures excel under these conditions! You see, Buggs were inspired by popular flies and utilize the most effective fly tying materials and techniques. Fly fishermen have a “match the hatch” mentality when it comes to fly selection. They also use materials designed to come alive in the water, even when the fly is resting on the bottom. We've applied this mentality to our lures for redfish, and we call them Buggs. We tie Buggs to imitate what redfish eat, including bait fish, shrimp, and crabs. All of our jigs are tied with bunny strips. 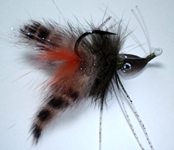 Bunny Strips come alive in the water better than any other fly tying material available. So in the most demanding sight casting conditions, to the most skittish fish, Buggs come alive. This is often the difference in getting that all important strike. 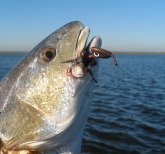 Buggs Fishing offers two collections of lures for redfish. The Gulf Coast Collection contains three models, including the Curl-Tail Jig, Double Bunny Jig, and the Beastie Bugg. The Curl-Tail Jig is our original model and still our most popular offering. It's the most versatile of the bunch, the swiss army knife of redfish lures. It gives the impression of everything a redfish eats, while not imitating anything exactly. And it works equally well in sight-casting situations or when blind casting to fishy water. The Double Bunny jig presents a slim profile and is a simple yet effective shrimp or small bait fish imitation. Then there's the Beastie Bugg, a crab imitation and all around sight-caster's dream! We crammed as much of our ingenuity as possible into this lure, making it look more alive, at rest, than anything we've ever seen. Our other lures for redfish are actually part of our Bonefish Collection. You see, Bonefish and Redfish might as well be cousins. They both inhabit shallow flats, searching for their prey, and are capable of fantastic runs when hooked! Bonefish eat the smaller versions of the same things redfish eat, primarily shrimp, crabs, and bait fish. Here's why this collection works equally well for redfish under certain conditions. There are times, every Spring comes to mind, when juvenile shrimp, crabs, and bait fish are the main food source for redfish. So they're keyed in on small bait, sometimes only an inch or two long. At times that's the only thing they'll eat. That's where these smaller jigs come in handy. Our Bonefish Collection consists of Bitty Buggs, Loco Buggs, Slider Buggs, and Hot Head Buggs. The Bitty Bugg is a small crab imitation, and we tie it in a Blue Crab and all black version especially for redfish. 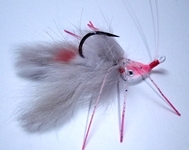 The Loco Bugg is a small shrimp imitation and comes in tan, pink, white, orange, and chartreuse. The Slider Bugg is a small bait fish or shrimp imitation and comes in tan, olive/tan, copper/tan, and chartreuse/white. 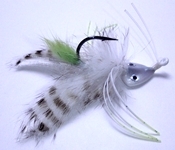 Finally the Hot Head Bugg is an ultra-realistic shrimp imitation offered in all of the colors of the Loco Bugg and more. These jigs are 1” to 2 1/2” long, and effectively imitate the small bait fish, shrimp, and crabs that redfish eat. From these two collections you have the best lures for redfish money can buy! They effectively imitate what they eat, the first important factor to consider when choosing the best lures for redfish. The dominant feature of these lures is the use of bunny strips. This helps them look alive in the water, even when they're just sitting on the bottom! Besides coming alive in the water, bunny strips are also very durable. That brings us to factor number two. Let's face it, the saltwater environment is harsh! Temperatures can soar, the water is constantly moving, and saltwater eats away at everything it touches. Then there's shell, which can be razor sharp, not to mention rocks, saltgrass, mangroves, and other debris. There are critters that can get you as well, including crabs, stingrays, and toothy fish. I'm convinced that this harsh environment makes redfish tough and extremely fun to catch because of the fight in them. It also puts a tremendous strain on your tackle. The best lures for redfish thrive in this environment. The picture you see below, courtesy of Captain Scott Null, is an example of this harsh but beautiful environment. This photo was taken near Galveston, Texas, an hour's drive from Houston, Texas. We build Buggs with these conditions in mind, from the hook to the jig head, from the bunny strips to the way we finish the lures. We start with a premium hook with a black nickel finish, needle sharp right out of the package. The hook we use is a Mustad 32796 BLN. It's a 60 degree jig hook with a flat eye and heavy wire. This hook is very strong and very sharp. It has to be because redfish are very strong, and because of the abuse some of our customers inflict! We have tournament redfish anglers who fish 60 pound braid. They absolutely horse oversized redfish into the boat so they can make another cast as quickly as possible to the school they're targeting. We mold the head to land hook point up, and we'll talk about how important that is in factor number three. If you look closely, you'll notice that the lead extends just up the bend in the hook towards the eye. This anchors the head on the hook shank, so it won't come loose when a redfish decides to test your drag and head for the intracoastal. We talked about how bunny strips come alive in the water like nothing else. They're also durable like nothing else. The bunny strips we use in our lures for redfish are actual strips of bunny hide, hair on one side and hide/leather on the other. The hide is tough as nails, trip after trip. It shrinks up and the hair looks matted when it dries out, but get it wet and it comes alive again and again. Even right out of the package, the hide won't look right unless it's wet, soaked all the way through. And that brings up a cool consequence of using bunny strips. If you want to give yourself every advantage on the water, soak your Buggs in scented liquid before you fish them! You have to get them wet anyway. As durable as the materials are, it won't matter much if they're not secured to the hook. That's why we hand tie each of our lures for redfish. When we're done we whip-finish the final wraps at the head and on the weed guard. A whip-finish is a fancy knot that secures thread wraps the best. It takes a little extra time, but makes all the difference in durability. The last step is to put a thin coat of head cement on the thread wraps. Again, a little extra time and money, but we want Buggs to last. We've actually been advised to eliminate some of these improvements, to skip a couple steps and save some money, so they'll wear out more quickly. We'd probably sell a few more lures. But it's not worth it to us, because we care about the integrity of the product. We don't want to sacrifice our reputation for a few extra dollars. And we appreciate the tremendous amount of time and effort it takes to get out on the water and in front of fish. Some of us are blessed enough to get there several times a week, or even on a daily basis certain times of the year. But most of us have day jobs, families, and other activities that compete with our love for fishing. When you're able to get out there, in front of the fish, and can put it all together and make the cast to a redfish....You can rely on Buggs, the best lures for redfish, to help you seal the deal. We talked about how important it is for the best lures for redfish to imitate what they eat. Then we explained how harsh the saltwater environment is, how strong redfish are, and how Buggs are up to the challenge. The third factor to evaluate the best lures for redfish is their effectiveness in shallow water. Sight casting to tailing or crawling redfish in skinny water is one of, if not the most thrilling fishing experience you can have. You have to calm your nerves, make accurate casts, and not spook the fish. That means your lure needs to land softly and stay in the strike zone. This starts with the weight distribution and overall size of the lure. The original Buggs jig head was designed with these conditions in mind. We modified the slider style head so it lands softly and hook point up, every single time. These soft landings are critical when fishing in skinny water. When the hook point is up it's less likely to snag on the bottom and your hook sets are more secure. Speaking of hook sets, you'll find your Buggs securely lodged in the corner of the fish's mouth, almost every time. This will keep your redfish pinned and keep the lure out of the crushers every redfish has to help them eat crabs. The original Buggs jig heads we use on the Gulf Coast collection come in 1/8 oz., ¼ oz., and 3/8 oz. They cast very well for their size and nothing lands more softly. The shape of the head also slows the fall rate compared to the standard shad style head used on most soft plastics. This really comes in handy when blind casting in knee deep water. You can work these lures for redfish more slowly yet still keep them off the bottom, out of the grass and shell. The Bonefish Jig heads come in 1/16th oz and 3/16th oz., and use smaller hooks. The hook size is equivalent to what you would tie saltwater flies with. We mold the 3/16th using a hidden lead technique, making it even more streamlined so it lands very softly. These heads work very well in extreme sight casting situations in skinny water or to ultra skittish fish. One of the joys of sight casting to redfish in such shallow water is that you can see them react to the lures. I'll let Captain Scott Null share a story here about the new Beastie Bugg. “I really like the new Beastie Buggs. I saw an upper slot fish about a month ago and cast the Beastie to it. He heard the lure hit and started searching for it. It was just sitting there on the bottom and I just gave it a slight twitch of my rod tip. Then the redfish did something awesome and I saw the whole thing. He tipped up on the lure, and his tail came out of the water just like he was feeding! He looked at it for a second and then just crushed the lure! I could feel the strike all the way through the line to my hand. It was the hardest hit I've had in a very long time.” We appreciate Scott Null's contributions to this article, including the two pictures of feeding redfish schools taken from the shallow water skiff he fishes out of Galveston, Texas. Yes, within an hour's drive of Houston there are world-class sight casting opportunities for redfish and other species. If this sounds like fun, we highly recommend his services. 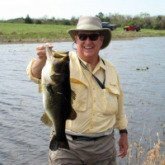 For shallow water fishermen and fly fishermen - you can reach him at 281-450-2206. Conclusion - Tournament Winning Tip - Sweet Deal on Buggs! The Gulf Coast and Bonefish Collections from Buggs Fishing are the very best lures for redfish money can buy. 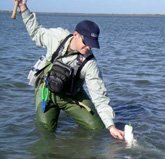 They effectively imitate what redfish eat, including the full sized and juvenile versions of baitfish, shrimp, and crabs. They all utilize bunny strips, which come alive in the water like nothing else. And they're very durable, fish after fish, trip after trip. Lastly, they excel in the most demanding sight casting conditions. The shape of the jig head helps them to land softly, fall slowly, and rest on the bottom hook point up. If you're read this far we really appreciate your interest in Buggs. Here's your award – a Tournament Winning Tip on working the lures! One of the best ways to hook a redfish while sight casting is to land the jig a couple feet from his nose. When the jig is resting on the bottom in view of the fish, give it a little twitch of your rod tip. This can be accomplished by just squeezing the rod handle when the slack is out of the line. This will make the head scoot just an inch or two along the bottom. The head will kick up a little puff of sand or mud on the bottom. This looks exactly like a redfish meal trying to escape. The redfish will go crazy and inhale the lure! We hope you enjoyed learning about the best lures for redfish. Better yet, we hope you'll put them to the test the next time you go fishing. So here's a bonus! If you've never ordered from us before, we invite you to visit our online store and place an order. We offer the lures individually and in kits for popular destinations and to help you save a few bucks. When you place your order, in the comments section at check out, write “Best Lures for Redfish” and tell us an extra lure you'd like us to throw in. It's our way of saying thanks for your order and for trying out Buggs! Head to the Online Store and check out all the Lures for Redfish!